Do you like Ted Nugent? 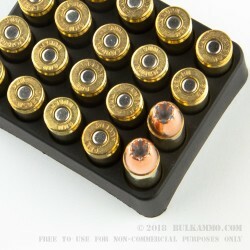 Either way, this 9mm Luger ammo is a great hollow point to carry in your pistol. 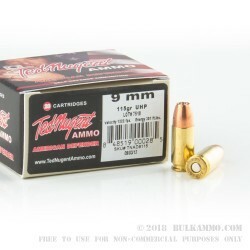 This product, from Ted Nugent Ammunition, features a 115 grain unicore hollow point bullet, and an advertised muzzle velocity of 1,222 feet per second. The uni-cor bullet is produced by Speer, and has a bonded core design. This bonded core keeps the lead alloy core "bonded" to the copper jacket, which greatly increases weight retention and improves knock-down power. 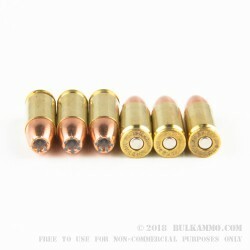 This bullet should have about 12-14 inches of penetration in ballistics gel, and should expand even when fired through intermediate barriers like denim, cotton, and leather. Each round is brass cased, boxer primed, non-corrosive, and reloadable. 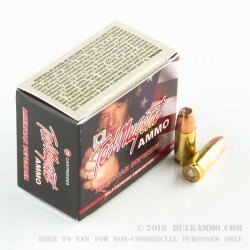 Order you ammo today, and be prepared for the worst!